From savory quesadillas to terrific pizza, here are seven ways to use leeks. 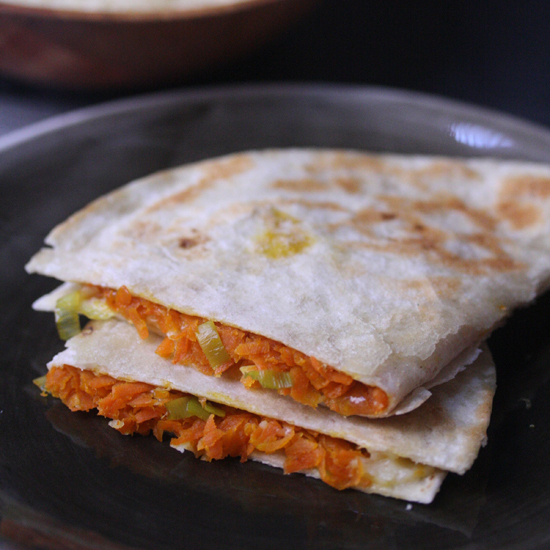 These fast, vegetarian quesadillas feature leeks, carrots, cheddar cheese, Sriracha and honey. Sautéed leeks and nutty Manchego cheese star in this delicious version of the classic pasta dish. Leeks are fantastic in this spring vegetable soup and this vibrant vichyssoise made with radish greens. Leeks are a great substitute for the traditional scallions in this Japanese-inspired recipe. This savory focaccia is delicious on its own, but it's exquisite with a light brushing of California truffle oil. Or try these crispy Afghani fry breads served with nutty cilantro sauce. Leeks and juicy rotisserie chicken make fantastic pizza toppings. Chef Armand Arnal's excellent salad combines leeks, a simple red wine vinaigrette, fresh toasted walnuts and the sheep's-milk cheese, Tomme de Brebis. Or, use whole grilled leeks in this fast, healthy salad.